Since becoming a National League Franchise in 1961, championships have eluded the Minnesota Vikings. Technically, the Vikings were the 1969 NFL Champions after beating Cleveland 27-7 in the NFL Championship Game. That game was before the official AFL-NFL Merger prior to the 1970 season. It is why it is a technicality. The win by the Vikings earned them a berth in what then called the final AFL-NFL World Championship game (now called Super Bowl IV). Minnesota lost to Kansas City 23-7 in that game. The win over Cleveland was the first of 10 appearances by the Vikings in what is now called the NFC Championship Game. After winning the first four games (and losing all four Super Bowls), the Vikings have lost six straight title game appearances, including Sunday’s 38-7 waxing in Philadelphia. No. 10: 1973 vs. Dallas, 27-10 – In the four seasons since the Vikings lost to the Chiefs in Super Bowl IV, the team built a strong offense to compliment the continued dominance of the Purple People Eaters defense. The Vikings’ offense was 9th in the league in scoring behind “The Scrambler” Fran Tarkenton and running back Chuck Foreman. The defense finished 2nd in the league in scoring, allowing just 12 points per game on the season. The Championship game was one-sided. A 14-2 Vikings team took apart the Cowboys. Tarkenton tossed a TD pass, Foreman scored one and Cox added two field goals. The defense even got on the board on Bobby Bryant’s 63-yard interception return for a score. The Cowboys lone touchdown came on a Golden Richards punt return TD. A year after their perfect season, the Miami Dolphins ran all over the Vikings defense in an easy win. Larry Csonka rushed 33 times for 145 yards and two scores in the Dolphins 24-7 win. No. 9: 1969 vs Cleveland, 23-7 – The Purple People Eaters were in the early stages of becoming the most ferocious defense in the NFL. Hall of Famer Alan Page had one of the Vikings two sacks in the game, Wally Hilgenberg had an interception and a fumble recovery, and Hall of Famer Paul Krause added an interception as the Vikings shutout the Browns into the fourth quarter. By that time, QB Joe Kapp has run for a score and passed for another, and Fred Cox (the guy who invented Nerf, by the way) nailed a pair of field goals in the win. The Vikings would lose to the Chiefs 23-7 in Super Bowl IV despite being a 12-point favorite to win the game. No. 8: 1974 vs. LA Rams, 14-10 – On a cold, windy day at the old Metropolitan Stadium, the Purple People Eaters defense of Vikings lore faced off against the Rams’ Fearsome Foursome in its prime. The Rams defense, anchored by Jack Youngblood, Fred Dryer (TV’s Hunter), Merlin Olson (TV’s Father Murphy) and Larry Brooks. It was 29 degrees at kickoff, with a 10 MPH wind and a wind chill that made it feel like 19 degrees. The Vikings had a 7-3 lead at halftime, with Fran Tarkenton tossing a 29-yard TD pass to Jim Lash. The Rams drove the ball 99 yards in the third quarter to the Vikings one-yard line. With the Rams at the 1, guard Tom Mack was called for illegal procedure (replays showed Mack never moved). After the five-yard penalty, Vikings legend Wally Hilgenberg intercepted a pass in the end zone to thwart the Rams’ attempt to take the lead. The Vikings led 14-10 in the fourth quarter and whittled the last 5 ½ minutes off the clock to close out the game. The Vikings were no match for the Steel Curtain defense in the Super Bowl. Pittsburgh won 16-6, as Dwight White sacked Tarkenton in the end zone for a safety, Terry Bradshaw had one touchdown pass and Franco Harris ran for another score for the Steelers. No. 7: 1976 vs. LA Rams, 24-13 – A year after the Vikings were upset in the 1975 playoffs by Roger Staubach’s “Hail Mary” TD (known to Vikings fans as “Drew Pearson pushed off”), the Vikings returned to the Championship game facing off against the Rams on a frigid 7-degree wind chill day at The Met. Although the Purple People Eaters defense was getting old, the Vikings raced out to a 17-0 lead as Bobby Bryant returned a blocked field goal 90 yards for a score and Chuck Foreman ran in a score. Quarterback Pat Haden rallied the Rams in the second half and closed to 17-13. The Vikings held on, as Bryant had two interceptions to go along with his defensive score. Foreman rushed 15 times for 118 yards and caught five passes for 81 yards. The Vikings became the first team to appear in four Super Bowls, facing Oakland in The Rose Bowl. Minnesota boasted all week their punt and kick blocking defense would be the first to ever block a punt by NFL Hall of Famer Ray Guy. They did in the first quarter, recovering the ball on the three-yard line. Two players later Brent McClanahan fumbled going into the endzone. It was the Vikings best opportunity in the game. The Raiders’ Pete Banaszak rushed for two scores, and quarterback Kenny Stabler tossed a TD pass and the Raiders routed Minnesota 32-14. The Vikings became the first team to lose four Super Bowls. No. 6: 1977 lost at Dallas, 23-6 – The Vikings opened the season with an overtime loss against Dallas. By the time the teams met again in the Championship game, the Cowboys had become a powerhouse. Led by Roger Staubach, Tony Dorsett, Robert Newhouse, Preston Pearson, Golden Richards, Drew Pearson and Billy Joe Dupree, Dallas was an offensive juggernaut that was second in the NFL in scoring offense. It was a 38-degree day with a wind chill of 28 degrees when the Vikings visited Dallas on New Year’s Day 1978. Minnesota only managed two Fred Cox field goals as the offense fumbled five times, losing three of them in a 23-6 loss. No. 5: 2000 lost at NY Giants, 41-0 – It would be 13 seasons before the Vikings would return to the Championship game after the 1987 loss in D.C., and it looked like the team still wasn’t ready. QB Duante Culpepper was intercepted three times by the Giants defense and passed for only 78 yards in the game. Giants QB Kerry Collins had a huge game, passing for 381 yards and five touchdowns. The game was so one-sided the conspiracies have prevailed that the Giants stole both the offensive and defensive signals of the Vikings. No. 4: 1987 lost at Washington, 17-10 – In a defensive struggle, the Vikings rushing game was held in check all day in a loss to the eventual Super Bowl Champion Redskins. The game was tied at 10-10 in the fourth quarter on the strength QB Wade Wilson passing game to tight end Steve Jordan and wideout Anthony Carter. Doug Williams led the Skins on a 70-yard scoring drive with five minutes to go, getting a 17-10 lead on a TD pass to Gary Clark. Minnesota responded by driving to the Redskins 6-yard line in the final minute. A potential game-winning pass to running back Darrin Nelson was dislodged by NFL Hall of Famer Darrell Green to preserve the Washington win. No. 3: 2009 lost at New Orleans, 31-28 – The NFC Championship game that real Vikings fans DIDN’T want to win. Led by despised quarterback Brett Favre (that guy that was really good for the hated Packers) and running back Adrian Peterson, the Vikings had the second-best scoring offense in the NFL in 2009. They waxed the Cowboys 34-3 in the Divisional Round before travelling to New Orleans to face the Saints in the Championship game. Peterson rushed 25 times for 122 yards and three scores in the game, and Favre tossed a TD pass to Sidney Rice. However, this game will always be remembered as Brett Favre throwing a stupid interception deep in New Orleans territory with the Vikings in field goal range for the winning score. The Saints would win in overtime. No. 2: 2017 lost at Philadelphia, 38-7 – The Vikings were the no. 2 seed entering the playoffs and earned a first-round bye. Minnesota almost didn’t make it out of the Division Round after blowing a 17-0 lead against New Orleans. Trailing 24-23 with 10 seconds remaining, quarterback Case Keenum connected with wideout Stefon Diggs on a 61-yard touchdown dubbed the “Minneapolis Miracle.” Travelling to no. 1 seed Philadelphia as a 3-point favorite, the Vikings got off to a quick 7-0 start on Keenum’s 25-yard pass to Kyle Rudolph. 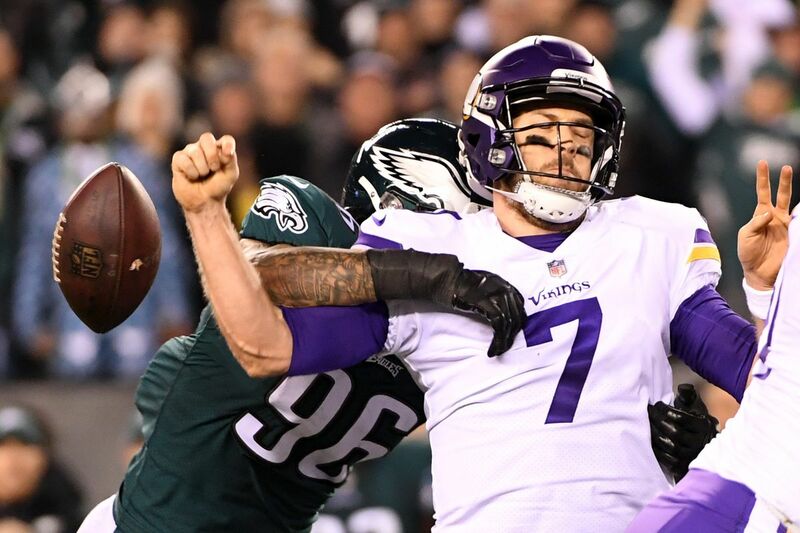 After forcing a punt, the Vikings were driving again when Keenum was intercepted by Patrick Robinson, who returned the ball 50 yards for a touchdown to tie the score. The Vikings never really threatened again after the pick-six. The Eagles scored the final 38 points of the game, and Keenum was picked off for a second time and fumbled once. No. 1: 1998 lost to Atlanta, 30-27 – The biggest heartbreaker of them all. The 1998 Vikings were the greatest offensive team in NFL history to that point. Led by Randall Cunningham, Cris Carter and rookie Randy Moss, the Vikings put up a then-NFL record 556 points while finishing with a 15-1 record. Gary Anderson set a NFL record by being the first kicker to make every field goal attempt and extra point attempt during a single season. Moss had 17 TD receptions, a rookie record. An 11-point favorite to beat Atlanta in the Championship game, the Vikings led 17-7 late in the second half and 20-14 at halftime. With two minutes to go and the Vikings leading 27-20, Anderson lined up for a 39-yard field goal to ice the game. Inexplicably, Anderson missed his only field goal of the season. The Falcons drove down the field to tie the score and force overtime. Each team had two possessions in overtime, and Randy Moss nearly caught a game-winning TD catch before it was broken up by the Falcons’ Eugene Robinson. On the Falcons second possession of overtime they drove the Vikings 21-yard line. Morten Andersen kicked a 38-yard field goal to pull off the upset for Atlanta.